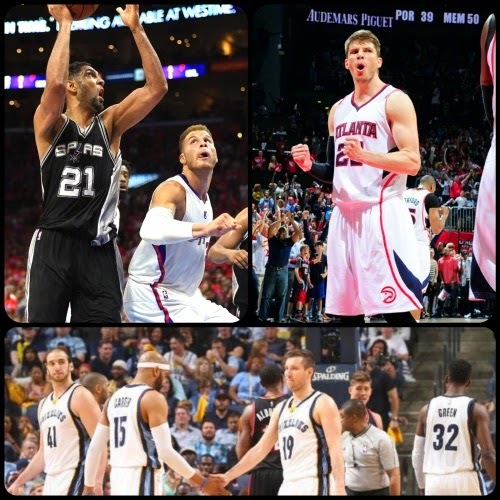 Hardly any surprise as Memphis and Atlanta went up 2-0 in their respective 2015 NBA Playoffs series, but the real doozy came when the Spurs and Clips played to OT in a classic back-and-forth slugfest. If only all postseason games were like that. Atlanta, GA (SportsNetwork.com) - The Atlanta Hawks continued this year's playoff trend simply by doing what they do best. Paul Millsap scored 19 points and led a strong performance from the perimeter that carried the Eastern Conference regular-season champions to a 96-91 win over the Brooklyn Nets in Game 2 of their opening-round series on Wednesday. The Hawks vaulted to the top of the East behind a 38 percent success rate from 3-point range, second only to Western Conference-leading Golden State for the best in the NBA. They made good on 12-of-31 attempts from beyond the arc on Wednesday, while staving off a determined late rally from the Nets to become the sixth team during this postseason to claim a 2-0 lead in the quarterfinals. Millsap went 4-for-4 from long distance and 7-of-11 overall from the floor, Kyle Korver buried a trio of treys en route to 17 points and Jeff Teague hit a pair of triples while compiling 16 points and six assists. Al Horford added an inside presence as well for Atlanta, putting up 14 points and grabbing 13 rebounds in addition to dishing out seven assists. Just as they did in Game 1, the Nets controlled the paint and put up a spirited comeback effort in the fourth quarter that ultimately fell short. Brooklyn cut a nine-point deficit down to 92-91 with under a minute to go, but the Hawks closed out the game at the foul line after Deron Williams' short baseline jumper rimmed out in the final seconds. Jarrett Jack tallied 23 points on 9-of-13 shooting for the eighth-seeded Nets, with Brook Lopez finishing with 20 points and Joe Johnson scoring 19 in defeat. Memphis, TN (SportsNetwork.com) - Mike Conley had 18 points and six assists as the Memphis Grizzlies cruised to a 97-82 win over the Portland Trail Blazers to jump out to a 2-0 lead in their Western Conference first-round series. Marc Gasol posted 15 points, seven rebounds and five assists, Zach Randolph provided 10 points and 10 boards and Courtney Lee netted 18 points for the Grizzlies, who turned the ball over just six times. LaMarcus Aldridge tallied 24 points and 14 rebounds to lead Portland, which was without Arron Afflalo and Chris Kaman due to injury. Game 3 is Saturday in Portland. Los Angeles, CA (SportsNetwork.com) - The Spurs faced their first 0-2 series deficit since 2010, but Tim Duncan had other plans in mind. Duncan posted 28 points, 11 rebounds and four assists and San Antonio picked up a crucial 111-107 overtime win over the Los Angeles Clippers to even their first-round playoff series at one game apiece. Duncan was forced to play 44 minutes, more than he logged in any of San Antonio's 23 playoff games last season, but the 38-year-old still found a way to produce when it mattered most. It was tied at 101-101 with less than two minutes to play in OT when Duncan hit an off-balance hook shot over the NBA's leading shot blocker, DeAndre Jordan. Patty Mills and Kawhi Leonard put in layups on the next two trips to make it 107-101. The Clippers wouldn't go down without a fight. Chris Paul hit a 3-pointer on their next trip and after Mills made it a five-point game with a pair of free throws, J.J. Redick potted a 3 to make it 109-107. Mills, who forced overtime with two foul shots late in regulation, stepped up to the line once again and put the game away with two more. He finished with a playoff career-high 18 points off the bench, while Leonard tallied 23 points and nine boards for the reigning champs. The Spurs will host Game 3 on Friday.